Overtraining is a case of too much of a good thing. Working out of course is to be encouraged and has many great health benefits as well as improving your lifestyle and even your sporting prowess. Most people have the problem of not training enough – and overtraining seems like a very alien concept. However overtraining is very real for some people who take either their sport or their fitness in general too seriously and means working out too much and too hard; which can be just as damaging to you if you don’t know how to handle it. Here we will look at what overtraining is, and through understanding we will address how to combat its negative impacts. So if working out is good, what is it that makes too much of it bad? Well to understand overtraining you must first understand training in general. Essentially, when you work out this means that you are going through a range of movement against resistance and that means that you are overloading the muscle compared to what it is used to. This then means that it causes thousands of tiny tears in the muscle fibers which make up the muscle as they essentially rip under the pressure. These are called ‘microtears’ and they are instrumental in hypertrophy (the technical term for muscle growth). Essentially when these microtears occur the muscle fiber gets marked for repairing and this means that the body recruits nearby satellite cells made from the protein in our diet to repair them while we rest. This in turn builds the muscle fiber up larger and thicker and that makes it stronger and more resistant to tearing in future. It also means that your muscle will become more compacted and ultimately visibly larger. The rebuilding of the muscle is also further encouraged by the release of ‘anabolic hormones’ in the body such as testosterone and growth hormone straight after a workout and when we sleep which encourage repairs and regrowth. 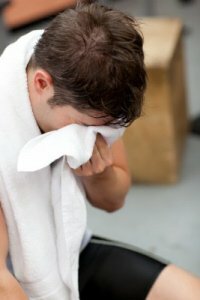 For all this to work then there are several crucial steps – to provide enough resistance to create the tears, to make use of your body’s anabolic hormones, to get sufficient rest, and to get sufficient protein which gets broken down to its amino acids and then reconstituted to form our muscle. If any part of this is missing then that can cause serious damage to our health over time and that’s where overtraining comes in. So in overtraining one part of this equation is missing and you are essentially training in disproportionate amounts while not providing the body with adequate time to relax or the materials it needs to repair the damage you are doing. You can overtrain then while not doing much exercise if you just aren’t getting any sleep or protein, and likewise you can feel free to workout hard and for long periods as long as you do provide the protein and rest in the right amounts. What happens here then is that your muscle fibers are ripping, but that you aren’t letting the body heal them. This then of course results in achy and weaker muscles that won’t get larger but will be ‘lagging’ behind trying to make up for all the stress they’re already under. If they are being damaged faster than you’re letting them recover then you will actually lose muscle mass. At the same time your immune system will be constantly working to repair the muscle and this will mean that it is constantly depleted of energy and pulled in multiple directions. It takes energy just to repair and maintain muscle so suddenly this energy bill will become bigger and your body will struggle to pay it as well. You will feel tired and lethargic as a result, and at the same time you will find that you become prone to illness and get lots of colds and flues. This will prevent you from training properly of course – so actually taking the necessary breaks and eating enough protein will help you to train longer than trying to cram it all in right at the start. There are other things that add to this feeling of soreness and lack of energy. For instance if you’re not eating enough protein to match the amount of training you’re doing then you’ll find that your body is sharing the protein you have between tasks and that means that wounds and other things won’t heal as quickly and you’ll be more likely to scar. Furthermore if you are training with high intensity then you will be using up a lot of the energy you have readily available in your system. Once your body has used up all of the available carbs in your blood and stored in your muscles, it will then be forced to find it in alternative sources. At first this will mean that it burns your fat (which takes longer and requires heavy breathing) and once it has run out of fat stores it will move on to other sources such as your protein and that will mean that it breaks down your muscle tissue and even your organs. This can cause damage of course, and even prior to this you will feel lethargic as a result of having used up all your readily available sugar reserves. Thus if you want to recover from overtraining you need to do the opposite for a while – to rest more, eat more and train less. Of course this might seem counterintuitive and it may not come easy to you to lay off of the training for a while. It’s important that you do though, and that you realize that you will be actually causing more growth by taking the time off in this case. This is because the tears are already there – and it is by healing them that you will grow. Nothing you do on top of this will help you to grow more until they are healed, it will only delay your recovery. One great way to help yourself to recover from overtraining is to simply take one week off. In fact it is actually highly recommended by many bodybuilders that you take a week off anyway around every four to six weeks – as doing so will cause you to ‘catch up’ and rebuild some of that torn muscle and this will help you to get more energy and to grow in size ready to hit it hard again. You’ll often find that even if you aren’t feeling overtrained – just taking a week off can be sufficient to make you grow considerably and gain a lot of muscle. You should also of course eat a lot of protein as that’s what your body will use as the building blocks to recreate your muscle. Eating a lot of protein is good for you anyway, but when it comes to recovering from overtraining it becomes even more essential as your body needs more of that protein to deal with the damage you’ve inflicted on it (this is also useful if you’re recovering from a wound of some sort). If you know that the damage is purely muscular and you want to give your system the best fighting chance of recovery then you can also benefit from using amino acid supplements, which is essentially protein in its purest form. If you purchase BCAAs aimed at bodybuilders this stands for ‘Branched Chain Amino Acids’ and basically means that the amino acids are going to be in the form that they are needed to build muscle already so that your body can more quickly and easily repair any damage without needing to expend as much energy. Other nutrients are also important for your recovery. You should be sure to get some complex carbs in your diet as building muscle takes energy. Likewise though consume vitamins and minerals such as calcium and zinc which also play a role in building those muscles. Then you need to encourage your body to rebuild and repair as quickly as possible by going into an ‘anabolic state’. An anabolic state is essentially a state where your body is keen to repair itself and to fix any injuries that it might have had previously. This is also the state in which you would grow as a child. During this time the body is resting and hormones such as growth hormone and testosterone are telling your system to rebuild. There are several things that can trigger an anabolic state and the release of growth hormone. One such thing is exercise, and this is why it is so important to eat your protein immediately after your training while you are still in an ‘anabolic period’. However that’s off the cards as you’re meant to be resting, so instead you can trigger an anabolic state by sleeping (yes, by its nature sleeping is an anabolic state while wakefulness is a catabolic state), by taking hot showers, and by eating red meats. You can also trigger growth through another mechanism – vasodilation – in which the blood vessels dilate thus allowing more blood and nutrients to flow to your muscles. Supplements such as NO2 achieve this, but likewise so does raw garlic and a range of fruit juices. Using these supplements while ‘regenerating’ is helpful to repair your body. Make sure to time them well and to get the protein you need just as you are entering this state. Of course they say that prevention is better than cure and that’s of course also the case in overtraining. To avoid overtraining then, you don’t need to go easier in the gym, you just need to break it up more. If you are hitting it hard, then just organize your sessions so that you don’t work the same muscles twice in a row. Likewise be sure to get plenty of rest and protein in between – and for maximum effect use the supplements listed above and take a week off of your training every six weeks. Following this advice should see you get better returns from your training, and avoid overtraining.